I have finally read a bookshot that I enjoyed. Okay, it was only the third one I have read, but the other two were so disappointing, it seems like I read more. Maybe it is just because I love the WMC series too much, or maybe it is Maxine Paetro’s writing that saved this one. Whatever it was, thank god! I was starting to lose hope in them. I think this storyline is what bookshots were made for, and the first two didn’t hit the mark. 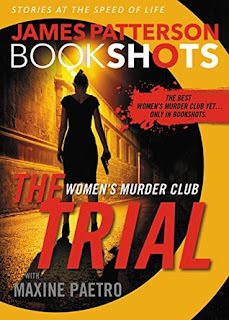 The Trial, as the title explains, follows one trial. The book is all about the one trial. I didn’t feel like any information was left out in this short format, and I didn’t feel like I was cheated. I could have read a full length novel and been satisfied as well, but it worked for bookshots.